Did any of that make a bit of sense? So should I just get on with today's post? It's about Mason jars, a subject that I've admitted to having a problem with in the past. These days I use very few plastic bags thanks to my fabric grocery bags and produce bags. Some time ago I realized that I could also add Mason jars to the arsenal in my war on plastic, especially when it came to buying dry bulk items. With the help of some fine sandpaper and chalkboard paint (both the spray can and a homemade batch), I covered the flat part of the 2-part lids. 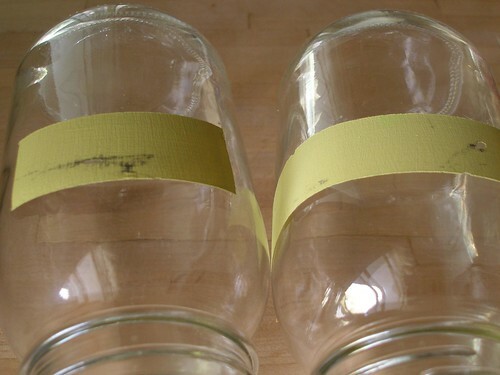 Then I could bring the empty jars right to the store and write directly on the lids. This was a less than ideal situation until I found the (queue celestial music) Chalk Markers (that should be said in a deep God-like voice). Because regular chalk? Not only did it look crappy, but I couldn't fit much more than the item number because the line it made was so thick. Oh, but chalk markers? So great. Writing with thin lines gives me plenty of room to fit in the name, item number and/or date which is super handy because, frankly, I don't know how old most of these things are. Some have definitely been around awhile. And is it lame that the reason I hadn't posted this idea before is because the plain chalk looked ugly? As much as I like functional, I adore pretty. I also tried putting the chalkboard paint on the side of the jars, but it presented a few problems. 1) I had to get special, smooth sided jars because regular Mason jars have all kinds of raised embossing on the side. 2) When I brought the jars to the store and back, the friction created as they rubbed against each other took off some of the paint, which made me very very sad. 3) I'm not completely sure I actually like the look. Though, to be fair I've only tried it with the green, homemade batch that matches the kitchen and not the black spray stuff, which looks a bit more, um sleek, I guess. In these pictures, they actually look pretty good, but all I notice when I look at them in real life is that the painted areas aren't completely lined up. And based on my experience with taping and painting these, getting them perfectly lined up is pretty hard to do. And I have just enough OCD in me to be bothered by that. Also, these shelves aren't tucked away in the pantry, but front and center in my kitchen. I just haven't been able to make up my mind to the point where I can commit to painting all my jars. -If you're interested in painting on the jars, what I did was tape off the area and do 3 coats of the paint using a sponge brush. -One thing I have noticed while using the markers on the homemade paint is that it sometimes doesn't come completely clean. It seems to work better if you rub a regular piece of chalk all over it and then wipe it off with a dry rag first, though. -I didn't have this problem at all with the spray on chalkboard paint. Those puppies wipe perfectly clean. -The lids are washable, but you don't want to let them soak in water for too long or the paint will start to peel off. -These markers are NOT messy at all once they're dry, which takes a minute or three. You can scrape it off with your fingernail, but otherwise they pretty much stay put and don't smear at all. -To remove the water-soluble kind, you just wipe with a wet rag. And according to the website, to remove the waterproof kind, you can use an ammonia based cleaner, like Windex. For those of you who haven't yet entered the drawing for a set of Chalk Markers, be sure to check it out. It runs through Sunday night. Oh how I love when I get instant grat on my questions :) Thank you, Wendy. 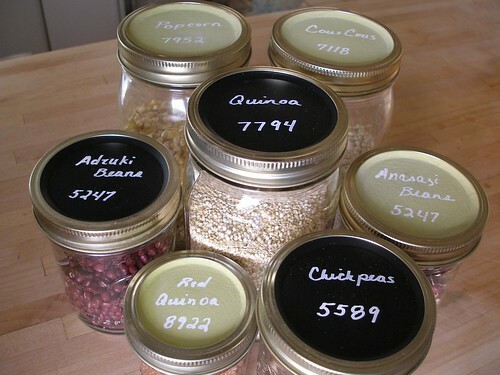 And now I'm convinced that THIS will be my solution to the Label-Maker tagged jars in my pantry. I shall get some black chalkboard paint, the chalkboard pens and have myself some kind of lid painting party. And then I'll go make us a chalkboard scoreboard for hillbilly golf, the garden markers, my cabinet door menu and probably a lot of other things so I should probably get a bunch of this paint. Oh, look at my Dorky now! Oh, one more tip when you paint the lids, obviously you should do them outside so you don't get lung cancer or whatever it is you get from inhaling spray paint, but the problem is that a bunch of pieces of nature blew onto the paint as it dried. It didn't look too bad, but still. I would suggest covering it with a clean box or something to prevent this. I think I love you... this is the best idea EVER! I was in awe of your jars before... but this? This is AMAZING! "It's about Mason jars, a subject that I've admitted to having a problem with in the past." I have a problem with glass jars, in general, but these are so lovely! 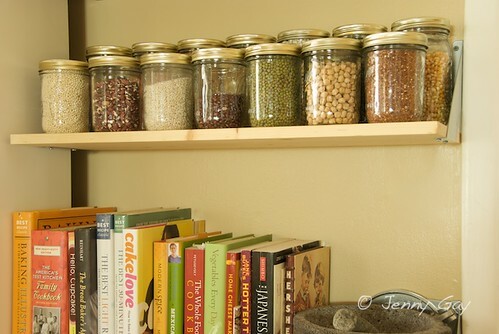 Now I am thinking about what I could do with my stash of used jam jars and salsa jars and coconut oil jars (oh wait -- I already store teas in those. Clearly, I have a jar problem, too, lol). 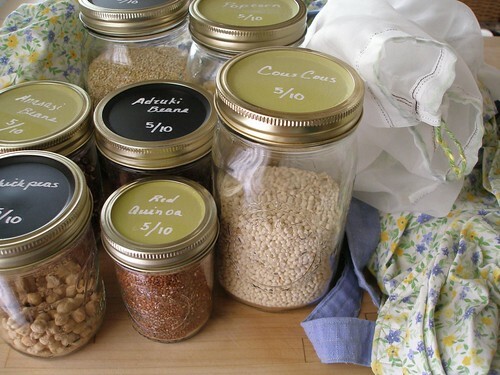 I love the ideas here and think the way you organized and labeled the jars is beautiful. Thank you SO MUCH for this post! What a great idea. I do a lot of home canning and we use mason jars for a lot of our leftovers as well as homemade mayonnaise. Needless to say , dates are important. I've been putting masking tape on and writing on the tape. This is a much prettier and longer lasting solution. RealLiveHouswife, if you'll be putting these in the fridge, be careful about condensation, which will erase the water-soluble markers. You'll probably want the waterproof ones, but I'm not entirely sure how well those work with the chalkboard paint, since I haven't tried them yet. Love these jars! thanks for sharing. One suggestion...if you want to use chalk on the sides of the jars, try using chalk cloth. You could sew a sleeve for the jar with the chalk cloth and slip it over the jar. 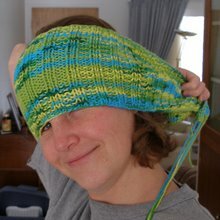 Perhaps, even, add border of lace or rick rack. This is a great idea! I have so many jars in my fridge & my pantry that are unlabeled (baking soda, baking powder, and powdered sugar all look virtually the same & taste testing them before baking always gets old!). I've just discovered chalkboard paint and I absolutely love it. Thanks for this great new use!! Ok, so after fixing my iron chairs in the kitchen which my hubby hand forged to add a better design and doors, I scheduled myself this weekend to reorganize the storage. 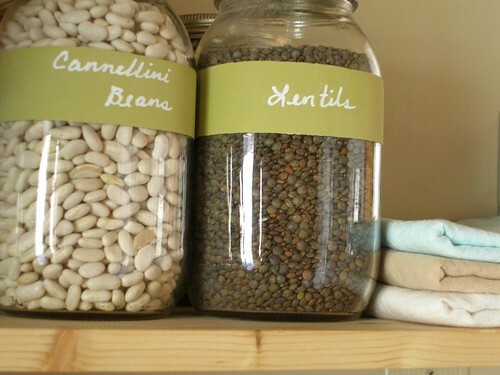 Glass jars are some of my issues in the cabinets! I love this idea, Wendy. Hope this will last. Gtg, I'll buy a chalkboard paint. Hehe! oh wow! just saw this from a link on the food in jars sight comments. i may be stealing this idea! i write on my jars in sharpie, which comes off super easy with baking soda. but this looks helpful for freezer jars and spices. p.s. can you run them through the dishwasher? we brew our own beer, and i'm thinking this might be a good idea to do with our bottles, but only if it sticks through the sanitizing process. ciara, I'm pretty sure they won't make it through the dishwasher, but I guess it never hurts to try!